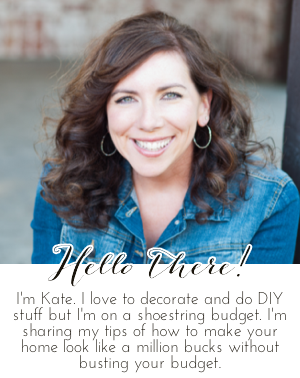 Chic on a Shoestring Decorating: Spring Cleaning on the Cheap with Allergies/Asthma AND a Giveaway! Spring Cleaning on the Cheap with Allergies/Asthma AND a Giveaway! I have to clear everybody out and open the windows while I'm cleaning and still the stink will linger for the rest of the day. Even in the dead of winter I'm cracking a window to let some fresh air in when I use certain products. Not exactly practical with the furnace or air blasting. After we found out one of my boys had bad allergies/asthma I looked into some organic/natural based cleaning products found in stores. Ummm... major sticker shock for the prices on most of that stuff. I forked over the cash for a few and was unpleasantly surprised that they were really stinky too, only in a bad smelling herb type of way rather than a harsh chemical with fragrance added type of stink. Plus, many of them didn't work very well so I paid double for equally stinky products that didn't work, awesome, right? I didn't do my homework on any other products than what was available at my discount store. I figured I'd be stuck opening the windows and banishing everyone else to the basement while I cleaned with Fan-stinky-tastic forever. If you read enough blogs you'll see Shaklee all over the place. I started looking into it and realized that this could be the solution to having a clean home without the fumes or the expense of natural cleaning products found in stores. I was so excited when Jennifer, a Shaklee independant distributor, contacted me to see if I'd like to test out some of their products. Of course I said yes! She sent me the Shaklee Get Clean line to honestly review and all opinions are 100% mine. It came with a bottle of multi-purpose Basic H, 3 super cute spray bottles, a mircofiber cloth and a window cleaning cloth. Aren't those the cutest spray bottles ever? First, I filled my spray bottles, each cute bottle is conveniently labeled with directions. The window cleaner takes 1 to 2 drops (that's right, DROPS) added to a full bottle of water. 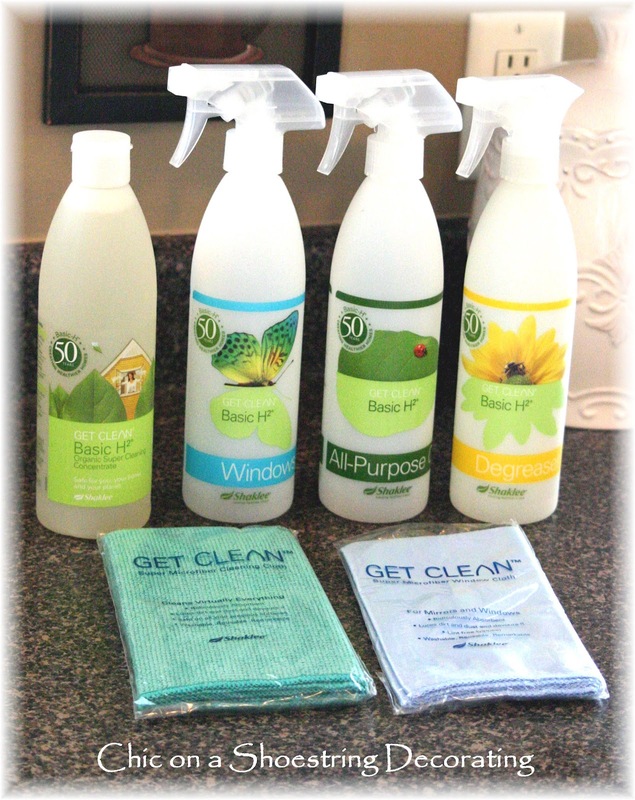 According to Shaklee "1 bottle of Basic H2 equals the cleaning uses of 5,824 bottles of 26 oz. Windex®*"
One bottle of Basic H is going to last FOR-EV-ER and is around $12 bucks. I'd call that a deal. Basic H can be used to clean just about anything and it has absolutely NO SMELL. I can't even believe how smell-less it is, I can spray it around my kids without worrying about stinky fumes and it actually works! I first used the Basic H All-Purpose cleanser for my stainless steel appliances. If you have any stainless steel appliances in your home you'll probably agree with me that they are a pain in the booty to keep clean, especially with kiddos running around touching them because those shiny surfaces are just screaming "please touch me all over with your sticky little fingers!!" 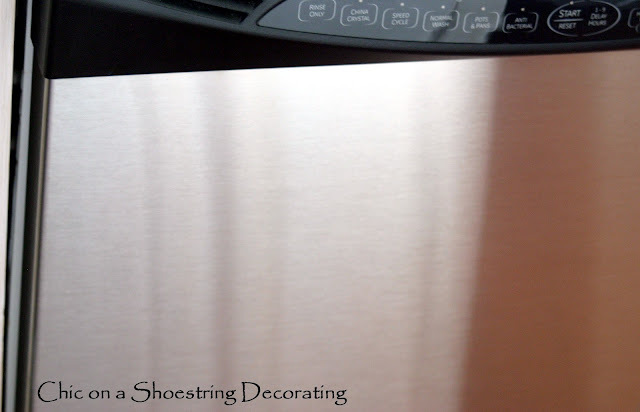 There also aren't a lot of good products that clean stainless, even the products specifically for stainless can smear it all up. You can see below that my dishwasher is a little drippy/smeary/fingerprinty. A few squirts of Basic H All Purpose and some swipes with the microfiber towel and it was shining like new! I used it on all my stainless steel appliances and it worked great. I did have some trouble with a few spots on my fridge that had been on there for months ahem, quite a while. They were "set in" if you will. However, it worked great on everyday smudges and fingerprints, perfect for a quick shine-up. 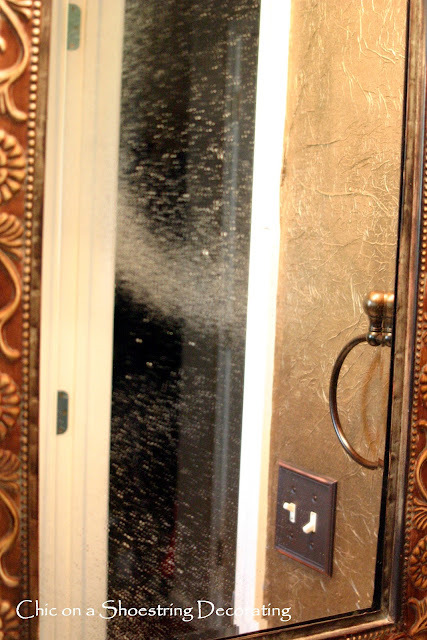 I tried out the window cleaner on my powder room mirror. There were some splatters on it which are pointed out with arrows (it's hard to take a picture of the surface of a mirror!) Plus some streaks from whenever I cleaned it last time with that blue stuff. A few squirts of Basic H Windows and some swipes with the Shaklee window cloth and it was sparkly and streak free! When I use that blue window cleaner I wipe and wipe and wipe and can't get rid of all the streaks. This was clean and streak free after just a few swipes! You might remember that I love glass cloches (aka: glass domes). I have too many a nice collection and they are big time dust collectors. I used the Basic H Window Cleaner to shine them up. A squirt on the Shaklee mirror cloth and a quick cloche rub down and it's squeaky clean and spot free! 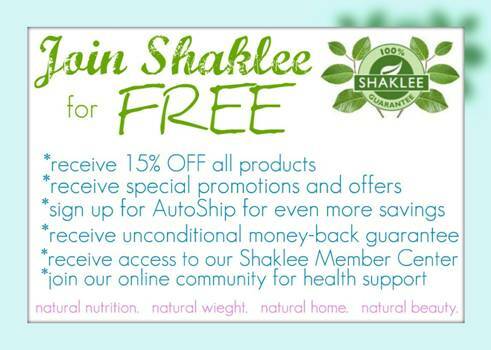 I'm so excited to try more of Shaklee's products I can hardly wait! 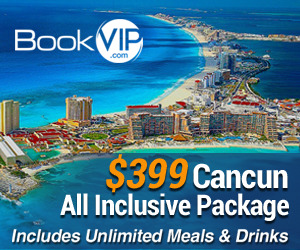 If you'd like to give it a try, click the link in the caption below and take advantage of the May special. Jennifer was generous enough to giveaway 5 Shaklee Basic H samples to my readers! Winners will be chosen by Random.org on Saturday, May 19. Oh I would LOVE to try this stuff as an allergy peep right here!! In fact, I'm currently checking the website to see if they ship to Australia!! I follow her blog anonymously. I would like the get clean house, or kitchen!! Sorry the above is there twice because it told me there was an error and the comment hadn't posted. Change one of those to me being a liker of your group on Facebook. I'd like to try out that household mini kit to get a feel for the products. I tried my first micro-fabric window cleaning cloth a month or so ago. I just could not believe how great that worked! I follow you thru my Bloglovin Reader. I'm following Blissfully Ever After's blog. I went to her Shaklee site and would love to try out Basic H2® Organic Super Cleaning Concentrate. I am following Blisssfully Ever After's blog. I love the Fresh Laundry Concentrate! I am always looking for something that smells nice and fresh, but still cleans really well! My husband is in the Army so detergent that can get out tough stains is a must! I love your enthusiam!! I wanted to let you know that I would absoultely be able to send a sample to you if you win and if you decide to order, I would order the products for you, have them shipped to my home, and then ship them to you. It is my pleasure to help with that! Hope you are doing fabulous and good luck! Thank you to all who have entered the giveaway thus far!! I am so excited to stay connected with you and for 5 of you to try Basic H!! I've heard so much about Basic H and would love to try it! I want the Basic H2. I'd love to try the dish wash concentrate! I like Blissfully Ever After on Facebook! Basic H2 & Scour Off Paste - Love to try! Just signed up for Blissfully Ever After Blog Updates! I follow your Blog! Thanks for all you share! I would like to try scour off! I already follow Blissfully every after! Now following blissfully ever after blog. I follow Blissfully Ever After by Google feed. I added you on GFC. I would love the basic H2 cleaner! I liked Chic on a Shoestring on facebook! I liked BIissfully Ever After on facebook!